The Obama team and their panting news media lapdogs sure are sweating Obama’s “you didn’t build that!” admission. It’s like watching a cavalcade of painted clowns clambering over each other to distract from, or explain away the damaging comments. Mitt Romney’s plan of blatantly lying about President Obama’s “you didn’t build that” speech is clearly drawing blood. But what makes the attack work so well is not so much the lie itself but the broader subtext of it. This is just incredible. How could anyone write these things seriously?! While the liberal left continuously accuses conservatives of racist “dog-whistles”, they blatantly run behind racially-based explanations of anything Obama does to defend him. Notice also that he inadvertently confirms the conservative criticism that it’s the liberals who are race-obsessed. In a melanino-centric politics, all events, people and ideas have to be translated through dark brown-colored glasses. Thus, conservatives criticize Obama for being essentially socialist, extremist, radical, and statist, which are all supposed “dog-whistles” for race. But when Chait expressly says that “the core of Obama’s entire political identity” is a political fear of being seen as a black politician, this is intellectual brilliance! Finally, it doesn’t matter what Obama actually IS. What Chait defines Obama as being, is an appearance, and even more accurately, the fear of an appearance, inextricably bound by racial identity. I notice that when “racist” conservatives criticize Obama on his political policies, “color-blind” liberals defend him primarily on racial grounds. 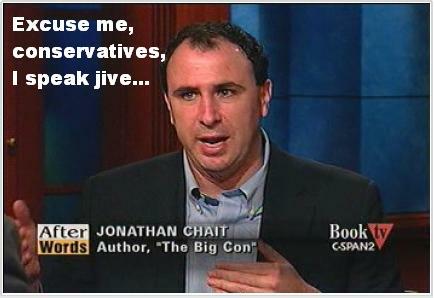 Let us all thank Jonathan Chait for his brilliant analysis and his wise teachings on how to decipher “black dialect”. * “master” is a racist dogwhistle.